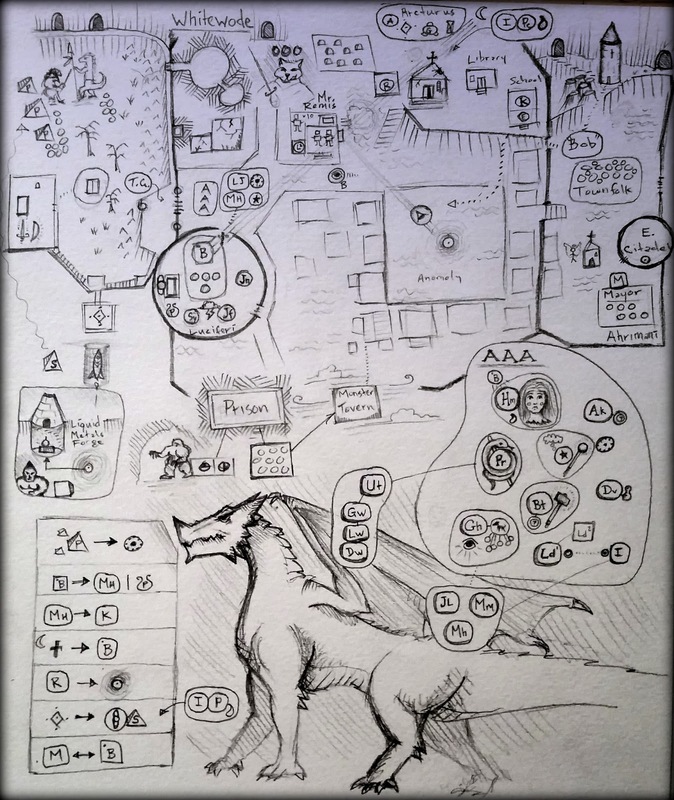 Below is the final version of the Whitewode Campaign Story Map. As I mentioned in my previous post this kind of map is used as a memory device to allow me to see the grand sweep of the Campaign at a glance. It shows major characters, related objects, moods, and key events occurring currently as relates to Whitewode. Spoiler Alert! If you are one of my players you may want to avert your eyes from this post until the end of the Whitewode Campaign. The first version is the simplest and contains the roughest overview, but would be sufficient to run the Campaign with. What it represents is a snapshot in time of who is who and where they are located, showing some additional elements such as mood and relationships. The second version shows the same information, but with more detail. However in this case I left out the relative locations information as I ran out of room on the side of the paper where things would normally go. 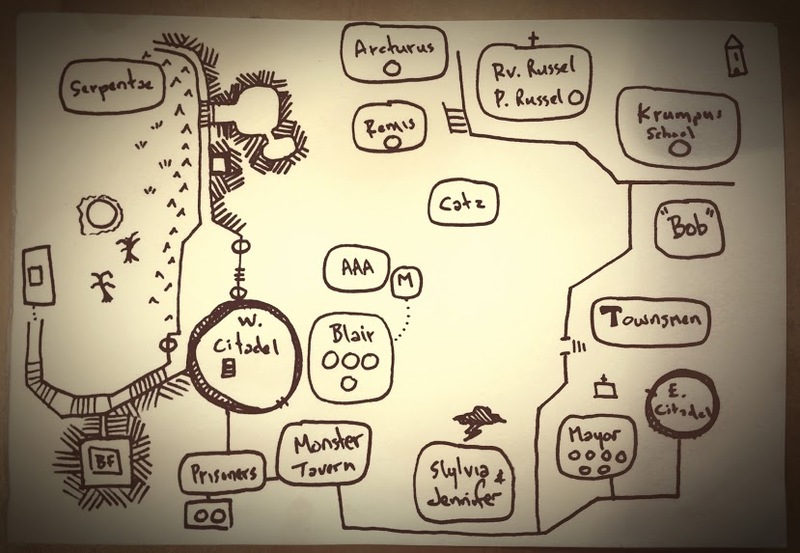 As you can see, it is an evolution of the first map and includes some additional detail, such as the key at the bottom which shows various objectives of specific characters or groups in the Campaign. 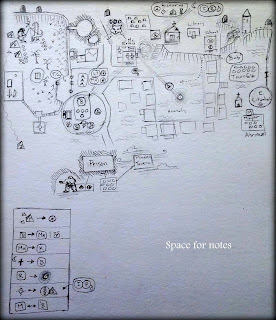 The third version is a combined and more complete combination of the first and second versions, which I posted in my previous blog post A Few Notes on Story Mapping which explains in more detail what is being shown. This version (3) certainly has enough detail to run with and includes everything I probably would need for the campaign. However, as I ruminated over version 3 I recalled additional elements that while not essential, might easily come into play soon. 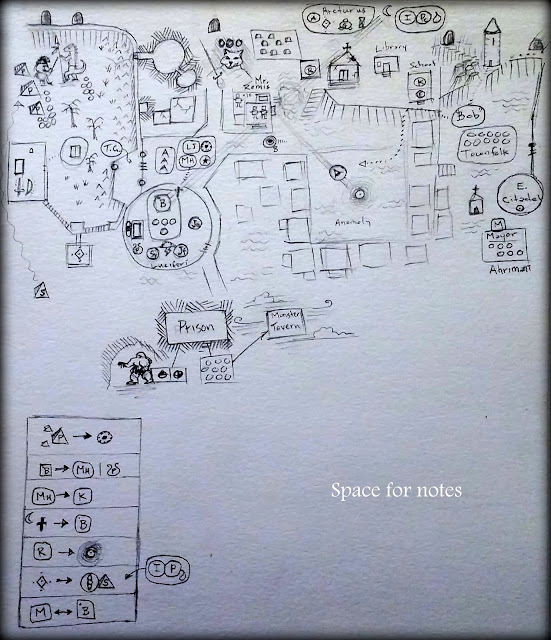 I also wished to clarify the environment such as the borders of Whitewode village, and give further hints as to the characters and include each of their most important aspects, which you can see in what was the blank space for notes earlier. So here is version 4 which I am considering final for the purposes of tonight's game. Note: if you want to see the enlarged view of the Story Map you can Right-click the image, and open in a new window. This will give you the jpg itself which most browsers will then allow you to zoom in on. Enjoy. Also note that during the game this kind of Story Map is really only intended for my own use as Gamemaster, and contains information which the Players are currently unaware of. Of course all of this information is coded in a way that would make it difficult for the Players to interpret even if they saw the map, and they certainly would not understand the references in a way that would allow them to act on that information intelligently. So the map is not as much a giveaway as it may seem at first. Lastly, I would like to point out that were I to write down all of the information in this image (which I have done elsewhere) then it would take up a great volume of pages, and not serve its intended purpose which is to give me a way to view all the important details of the Campaign at a glance. And that is the true beauty of the Story Map method. Spoiler Alert! 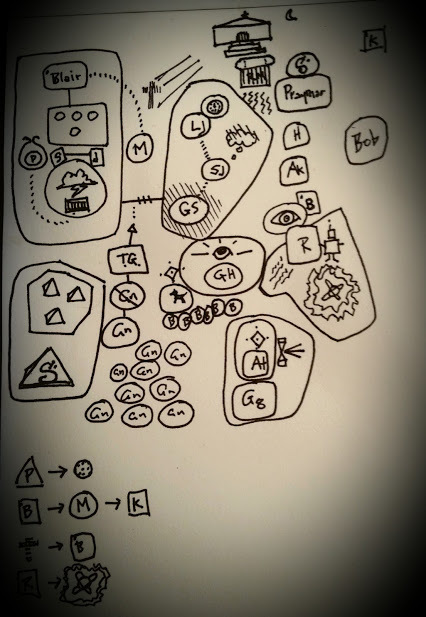 If you are one of my players you may want to avert your eyes from this map until the end of the Whitewode Campaign. In this case what you see are circles with letters in them that represent characters. Some are inside larger circles which represent groups of characters who are aligned by purpose. There are some simplistic graphical representations of mood or events related to the characters, such as the storm cloud representing a conflict, or the wavy lines representing a type of attack that is ongoing in the area. In most cases the locations of the circles on the page reflect the relative physical locations of the characters on the scene, although not to scale. This is to remind me visually not only who is related to who, but where, physically, they are located in relation to each other. Note that sometimes this is not convenient to do, such as when a group is split up and parts are in one location while others are in another location. So flexibility here is really key. The idea of the memory map is that it need not be technically accurate - it only needs to serve as a reminder of what is going on. If it does this then it has done its job. At the bottom of the page is a list of goals where I am showing characters and who or what they are striving for in a simple format: character X --> Thing or character Y. If there are multiple goals or a domino set of goals then it is X --> Y --> Z. If two characters are competing for the same goal then X --> Z <-- Y. etc. If characters are moving then it is represented with a dotted line and an arrow showing the direction. All of which when combined helps me to visualize the entire scene with the main events, motivations and goals of the groups involved in the conflict. There are no fixed rules for this, and no specific or unchanging nomenclature. 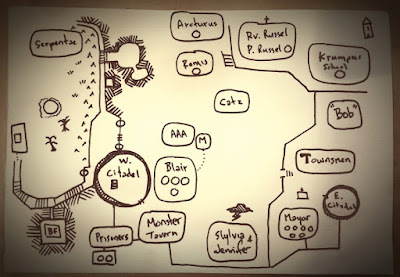 The purpose of the Memory Map is to remind me, during the game, what the big picture is, and who is where in relation to the others, and what their goals are. 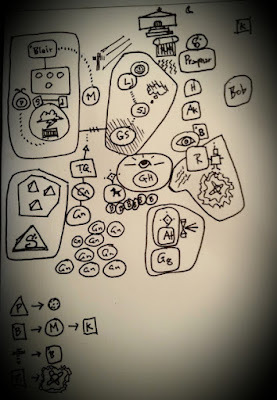 This is not to be obscure, but because I find that each time I make a Memory Map the situation warrants a slightly different approach, depending on the complexity and details involved. 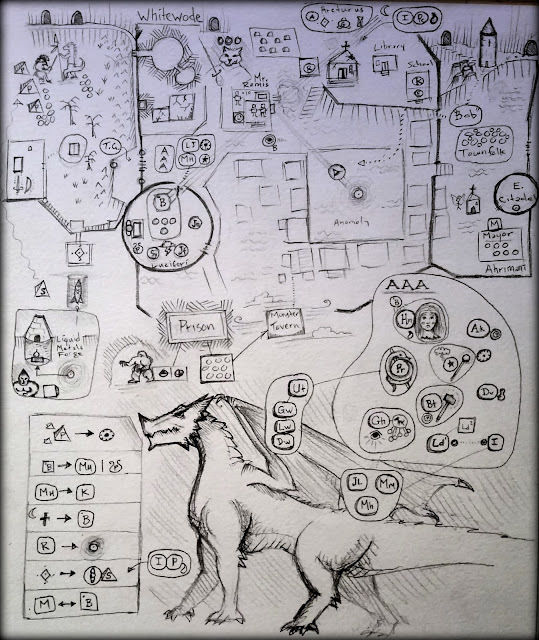 The Whitewode campaign has gotten rather complex, and so this map helps me to keep all of the factions, the timing of actions, the motives of all characters and their relative locations in mind during the game. Least I, ahem, forget something important. Pass-wall: A spell which opens a hole in a solid rock wall, man-sized and up to 10' in length. Duration: 3 turns. Range: 3" (~90'). Interesting for brevity. I imagine this could be extremely useful under the right circumstances. What is notable, though, is what is left out. We have no information on the nature of the hole. Do the rocks simply vanish? Or is it more like a worm-hole? What happens after the three turns? Does the hole vanish again? I'm guessing so, as otherwise there would be no need for a Duration of 3 turns. In other words it seems implied to work as follows: A magical opening in the wall appears either as a kind of worm hole in the wall, or creates a magical tunnel into another room or corridor, or outside, perhaps. The limit is by distance not type. It would also appear to close up again after duration. In other words, it's a temporary escape hatch through which your foes may not be able to follow. It depends on how fast they can get to through the portal. After 3 turns, which I believe comes to about 36 seconds. That would probably be enough time for a party of 12 to get through, if the opening were 10' in length, or less. If one defends the other side then you might be able to trap your unwitting assailants inside the tunnel when it vanishes. How slick that would be. Not only an escape hatch, but also a deadly trap as well. One that could fit perhaps 4 people in it, or potentially more if they squeezed in. Interesting indeed. We should note also that the Pass-Wall has a Range of 90'. That means that your party could be far enough away from the opening of the tunnel for you to march to it, at which point it would close because the 3 turns are up. So why would someone need to open a Pass-Wall when they are not directly next to the spot is not clear to me. I am sure that Gygax and friends must have found ways to use that to advantage, but I'm not sure I can imagine how at the moment. But still, it opens up potential options which could be exploited ... possibly. What would be especially handy, of course, is a mechanism by which the tunnel, or "Pass-wall" could be dismissed. So you don't have to wait for the 3 turns to time out, if you're just a few people who can jump through in a moment. So I would probably allow that, given that the Mystic could maintain control of the spell and then release it when they want to. That way the MU could time it so that opponents have filled the passage and then release it before they can get back out. Of course as GM you might not really want this spell to be used as a trap. It certainly follows from the rule that you could, I supposed, but it does seem to be contrary to the apparent intent, which is just as an escape hatch. I think. So, depending on how you rule that nuance you might simply say, that the Pass-Wall does not collapse until no one is remaining inside the tunnel. That amendment to the rule would eliminate the MU's ability to use the Spell as a trap. It would also, parenthetically, also eliminate the big Risk of using it. Namely, that the party members get stuck in the tunnel for some reason and it collapses on them after the 3rd Turn when the Duration runs out. What happens then? Well with the amendment that's not a problem. Without it, yup. It could be a problem. Fo Shizzle. What if your MU opens the portal as the party is being chased by opponents too powerful and ornery for them, but on the other side happens to be another force that takes umbrage to their sudden intrusion and happens to be even tougher than the chasing party ... and they consequently get stuck in the tunnel. Lets see how that might plausibly play out. Curious. Let's take it that the party is being chased and are trapped in a dead end room. In the first turn the Magic-User casts Pass-Wall, knowing from their map that another room is 10' away to the South. The spell works and there is a smooth stone-lined square shaped tunnel extending 10' into another room. The party rushes through in their normal marching order. They move forward until the first line of party members in the marching order are still inside the tunnel looking out. They see ahead, lets say, a room full of baddies, who have all stood up and drawn their swords. There's even more in this room than those behind. Hmmm... What to do? Someone says, "Lets go back and fight the weaker party,". Someone counters,, "No way, lets keep moving forward". The debate goes back and forth a bit and takes one turn. They decide to go back. The opponents are now crowded around the entrance with long spears pointing at the rear line members of the party, who have turned face to get the heck out of the tunnel before it collapses in 1 more turn. But the porcupine facing their weakest members is also daunting. No choice. Everyone rushes forward because in a moment the tunnel will collapse and people in the rear, who are probably still facing the onrush of opponents, are probably shouting things like "GO FORWARD YOU FOOLS!" The End. Anyway, you get the idea. This spell, without the amendment, when usable as an escape and a trap, does have risk. And the risk, frankly, is pretty high. I can imagine that being caught in a Pass-Wall collapse would be pretty conclusive. The end. For everyone in the tunnel. That's it. Just "bye". So that to my mind is the equivalent risk of being teleported 20 into the ground. It's over for you. It would also, at least in one scenario, likely take out everyone behind the front rank, should they be stopped in their tracks by an opposing force at the entrance of the tunnel when it appears. So yes, I think of that as pretty high risk. After all, hopping from room to room in a dungeon this way... I can easily imagine that there's a 50% chance the room is currently occupied by monsters of one sort of another. You have 3 turns to pass through the tunnel, so you better be able to get through because actually that's not a lot of time when total annihilation is in the balance. So I would probably offer two versions of this spell. Pass-Wall I, and Pass-Wall II. The second version would not have the amendment, and could be used as a trap, but also would entail the risk as well. I rate Pass-Wall I a 3 out of 5 Stars for effectiveness, which is reasonably highly on account of the fact that with the amendment it is probably useful for escapes so long as you are in a densely roomed dungeon environment. It happens. Pass-Wall II, on the other hand I also rate a 3, but for a different reason, though the first remains true just the same. In fact I would rate it much higher as an awesome double purposed spell with both escape and trap built in, were it not for the rather horrendous risk involved. So I'm going to propose yet another Pass-Wall III. This one would have the amendment, but it only applies to members of the party, instead of any creature as the Pass-Wall I amendment. In which case we would then have a truly awesome Pass-Wall version that is an escape, and a trap, yet also safe to use by the party. Nice. So Pass-Wall III I would rate a 4 out of 5 Stars for usefulness. The only reason it's a 4 rather than a 5 is because it would nevertheless probably be reasonably uncommon to be in circumstances where the Pass-Wall would actually be useful. Ok that's good for this round. Until next time, good gaming to you! Edit: Oh wait. I think I see the use for the 90' Range. Let's say you only go 10' and there's no room there? If you are at the entrance you can add another 10' to the wall at the end without having to walk into the tunnel. And potentially a third 10' section, but now your first section is due to collapse so you'd better hurry through! Hm... not sure if that's quite it, actually. Another post-publish thought ... as the picture at the top illustrates, this might have been intended for use by a flying MU as a personal escape route, and envisioned as such many of the fore mentioned issues go away. Flying MU's might well want a 90' Range by which to create a Pass-Wall... so long as they happen to know for sure a safe route through which to fly from room to room. It could be, after all that the Magic-User knows the complex very well, and as such this strategy of movement might be a very effective one. Say perhaps that the MU build the dungeon with this in mind, and it's intended use was two fold - one to create safe corridors by which the MU could fly around the complex, waging attacks on intruders perhaps, or as escape routes for overly-worthy opponents. Magic. There's a lot you can do with it. Kind of have to deal with audio issues for the first couple of minutes, but the conversation turned out to be rather interesting, so hang in there. Forgive me but I am going to ramble for a bit on Culture, and it's association to place, race, class and alignment in relation to my World of Elthos, and eventually The Mythos Machine. Anarchism - No rulers, each to his own. Tribalism - The clan chief as warrior-priest is absolute ruler. Monarchy - The Dynastic Monarch is absolute ruler. Oligarchy - The Wealthiest rule. Voting is for appearances only. Democracy - The people rule, one man one vote. Republic - The people rule through representatives, one representative one vote. Feudalism - The Lord rules vassels who own fiefs who are worked by serfs. No voting. Tyranny - The Lord rules everyone with absolute power. No voting. So let me relate this a little more to how I think of Alignments. 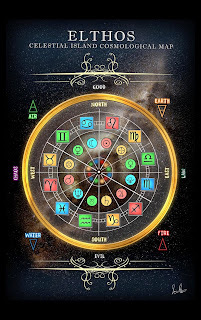 For one thing I have it that the Deities of Elthos are the personifications of the various Alignments, which are taken to be primordial and eternal constructs within the Realm of Idea. I call them Elkron (loosely translated as "the Eternal Ideas"). The Alignments are all associated to a specif Astrological Sign and Tarot Card, and with each one is a Theme, or statement that reflects the philosophy of the Alignment. Chaotic Evil - Ares - Wheel of Fortune - "Might makes Right"
Chaotic Good - Taurus - The Heirophant - "Reflect on the Truth and you will find it"
Chaotic Good - Gemini - The Lovers - "Love is the Truth"
Good Chaotic - Cancer - Temperance - "Patience is the Principal Virtue"
Good Lawful - Leo - Strength - "To thy Known Self be True"
Good Lawful - Virgo - The Priestess - "Kindness is Love"
Lawful Good - Libra - Justice - "Justice is the Truth"
Lawful Evil - Scorpio - Death - "Death is the Truth"
Lawful Evil - Sagittarius - The World - "Power is the Truth"
Evil Lawful - Capricorn - The Devil - "Evil is the Truth"
Evil Chaotic - Aquarius - The Chariot - "Action is the Truth"
Evil Chaotic - Pisces - The Fool - "No one knows the Truth"
Of course there is room for clarification and improvement on the Philosophic Statements, but as a starting point I think it will do. The crux of the thing is that each Alignment has a foundational philosophy that can be expressed in a single phrase. Furthermore, different Cultures are based on the philosophies that they hold to be most true. A culture of Tyranny, for example, may well hold that "Power is Truth" is the greatest truth of all. And so it will be with each Culture. So now I have a link between Cultures and Alignments that seems to fit reasonably well. Of course there will be many nuances, and some Cultures may have a mix of Alignments. For example, you might have a culture that is very strongly Good, and weakly Chaotic, but so expresses some Lawful Good aspects in regards to certain things (such as their Institutions). In fact, very few Cultures will turn out to be absolutely pure in relation to an Alignment, or as noted, a particular Deity. For instance, the various Greek City States were often dedicated to a particular Patron Deity (Athens to Athena), but also had temples to the other Deities as well. This shows that in any group of people you will likely have a variety of viewpoints. Further we might also notice that Cultures tend to occupy specific places. Rome has it's culture. And it spread that culture to the rest of Europe before the fall of the Empire at the hands of the Goths, at which point the Culture of Europe changed again. Thus, Places can adopt various Cultures over time. Before Europe was subsumed by the Culture of Rome, it had a myriad of local Cultures, and for the most part would probably be considered Celtic. So the Place's Culture can change over time. And yet, at any given time, every Place will have a Culture. We might also consider Race. Different Races have different Cultures. China under the Yellow Emperor (note the place and time) had a culture that was different in certain respects to that of Rome, while in other respects it was the same. The Yellow Emperor Culture was adopted by the people of China. And so it was carried by a Race. Still, the Culture among the Chinese people today is very different than it was five thousand years ago. So we can see that Races may change their Culture over time as well. Sometimes significantly. So we have Cultures that are embodiments of Alignment-Philosophies that can be adopted by Races and occupy Places in time. The Cultures that have been adopted can be cast aside and new Cultures adopted. This can happen, for example, when a Place is conquered and the people of that Place are subjugated by another Race. Or it could happen more subtly when new ideas are presented either by people indigenous to a Place, or from the outside, say through trade, or perhaps through the inspiration of a Deity or Divine Concept. The point being that Cultures in Time and Place among a certain people can be transformed or overthrown. So time is an important variable in locating Cultures. We should also consider, when talking about Race, that Cultures may not be considered human only. Perhaps other Races have their own Cultures. For example, Wolves have a Culture. So do Ants. So do Bees. So do Dolphins. In fact, every Race may have its own Culture. Or rather we might say every Race has one of a given number of possible Cultures. What I mean is that humans may have the same Culture as another Race. An example of that might be the Aniwaya, which was known among the American Indians as "The Wolf Clan". 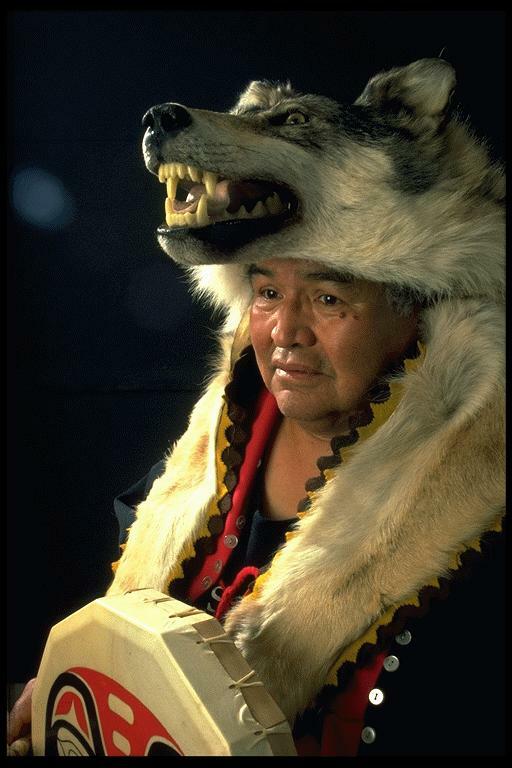 We can imagine that they had a Cultural affinity for Wolves and shared certain Cultural values with wolves. The Point here is that Cultures are not only transhuman, but may be shared across Races. Lastly, we should consider Class Cultures. Even within a single Race at a given time and Place there will be Cultural differences between the various Classes that make up a Society. Merchants will have a different set of Cultural values than Warriors. Peasants will have a different set of Cultural values than Aristocrats. And so on. I am going to speculate that these, actually, have less chance of changing over time than any of the others, because the Culture is going to be associated to the activity or occupation of the Class, and so probably remain consistent over time. For instance, Warriors may have a Culture of "Might makes Right" (or "Justice is Truth", depending on the specific Culture of the Warrior Class). They may share this Warrior Culture with other Races, but all of the adherents to those Cultural values are going to be Warriors. Whether they are Lions, or Orcs, or Humans, or Elves, Warriors all share a common attribute - they fight. Merchants, on the other hand, gather and trade. And they may share their Cultural values with other Races such as bees, and bears, and ants, and Kobolds, The point here being that Class may be a stronger determinant of Culture than anything else. I conjecture that the order of precedence therefore may be this: 1) Class, 2) Race, 3) Place-Time. So what does all of this mean for Elthos? And more specifically, the Mythos Machine? Well, I'm working on aligning this concept with my world, and then programming the concept into the Mythos Machine so that the software embodies my philosophy about Culture. That is going to be an interesting, albeit somewhat difficult proposition. This kind of structure, with the fluidity it encompasses, will not be easy to model in terms of data, or interfaces. I will be working on it, though, as I find the concept compelling and I think it will add another unique aspect to my project's design. I'll keep posting about it as I continue to think through how this would work in terms of both concept and implementation. If you have any thoughts on this, and more specifically how you might want to use this concept, please let me know. I'll be curious to hear about it. Thanks. Not much to say on this, except that I'm teaching myself Lightworks Video Editor (free, with a minor restriction on the size of the outputs, but good for youtube so ok). Lightworks, by the way, is said to have a steep learning curve. I will confirm that. It does. And the documentation thus far as left me not only scratching my head and poking google a lot, but also a bit puzzled about things like plugins, and how to handle some pretty simple seeming stuff. BUT ... once I started to get the hang of it, I realized that it is actually quite awesome and fun to use. You just have to get the hang of it.